Congregation Ahavath Sholom has been around for a long time — 120 years, to be precise. I’ve mentioned in previous columns that the organization will host a huge anniversary party on Saturday, March 2 at the synagogue, 4050 S. Hulen in Fort Worth. This is a community-wide event (free to members, with non-members paying $60 per person) and will include a lot of entertainment, a lot of food, gaming for prizes and live and silent auctions. The funds raised will benefit CAS’ Legacy Fund, which assists with youth education and other areas. CAS has been one of the important pillars of the Fort Worth Jewish Community (see story, Page 9), not to mention the oldest Jewish organization in the area, and this event provides a good opportunity to not only schmooze and have a great time, but also to support an institution that isn’t a whole lot older than the incorporation of the city of Fort Worth itself. To make reservations or if you have any questions, call CAS’ office at 817-731-4721 or email info@ahavathsholom.org. Also, I know many readers out there are descendants of CAS’ original founders (or descended from those who might have known the original founders). If you’re one of those, please share your stories. I can be reached at awsorter@yahoo.com. Furthermore, if you have simchas you’re celebrating, or any other news, feel free to reach out to us so we can write it up for this column. Synagogue designs and architecture have their own history, which is one of the topics that will be touched upon at “Biblical Influences on Modern Synagogue Art and Architecture,” which takes place at 6:30 p.m. Thursday, March 7 at Congregation Ahavath Sholom. The topic presented by the panelists — noted architects David R. Stanford, Gary M. Cunningham and Lynn Milstone — is synagogues. More specifically, the panel will examine ancient worship places around the world and compare those with contemporary architectural practices. Local sculptor Etty Horowitz will also be on hand to serve as the program’s moderator. The event is free to the public, but space is limited. Call 817-731-4721 for more information or to make your reservation. 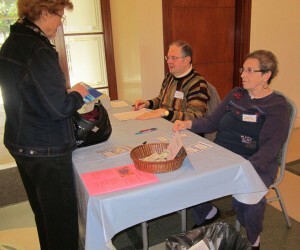 Jane Guzman Pawgan chimed in with some more interesting Texas history at the Daytimers’ event Feb. 15. Pawgan’s topic centered on Miriam Ferguson, wife of the beleaguered Texas governor James Ferguson, who was impeached in 1917. Miriam, known as “Ma” Ferguson, stepped ably into her husband’s shoes, running for, and winning the 1924 Texas gubernatorial race. Guzman shared this information (including Ma Ferguson’s opposition of the Ku Klux Klan as her campaign slogan) to the folks who were present. Others helping during the event included Bill Margolis (who introduced Pawgan), Kenneth Baum and Rosanne Margolis, who greeted the guests at the door, and Edythe Cohen and Louis Schultz, who oversaw the buffet table. Emcee for the day was Irv Robinson. The next Daytimers event will involve a virtual tour of Dallas/Fort Worth International Airport and will take place at noon, Wednesday, March 13 at Beth-El Congregation, 4900 Briarhaven in Fort Worth. Lunch will be catered, and the cost is $9 ($4 if you want to skip lunch). To make a reservation, grab your credit card and call Barbara Rubin at 817-927-2736 or Larry Steckler at 520-990-3155. Beth-El Congregation will present the final film of its film festival, “My First Wedding.” The film will be shown, free of charge, at 7:30 p.m. Tuesday, March 19 at the synagogue, 4900 Briarhaven. Congregation Beth Israel in Colleyville offers its “Good Food, Good Learning, Good Community” event, which involves a dinner, a minyan service and an interesting speaker. On Wednesday, March 6, the speaker will be Ron Bernstein, the Jewish National Fund Israel Emissary for the Southwest. Dinner is served at 6 p.m., the service takes place at 7 p.m., with Bernstein going live at 7:30 p.m. The event takes place at the synagogue, located at 6100 Pleasant Run Road For information or to make reservations, call 817-581-5500.
re the article in theTJP 2/21/2013 by Ann Wolff Sorter. The grandson of L.G. Gilbert, Dr. J.M.Gilbert lives in Mansfield, TX. and great nieces and nephew Cecille Price, Jessonda Fox and Louis ” Buddy ” Gilbert named after L.G.Gilbert live in Dallas. All are active members of Temple Emanu-El in Dallas and the community . JM has the same picture of LG featured in the article in his home. L.G. Gilbert was the first president of Congregation Ahavath Sholom. Sol Gilbert, LG’s son was a member but lived his adult life in Amarillo. The Granddaughter of Sarah Shandblum, Frances Kahn, lives in El Paso with her husband Dr. Stuart Kahn.